Here is a random nasturtiun from my back yard. Not relevant to anything else I have to say today. Just pretty. Now that I’ve got that out of my system, I’ll move on to my next random topic. The Junior Landcare Watermelon Challenge. It’s open to Australian children as individuals or as schools. The idea is that all entrants get sent watermelon seeds and growing information, watermelon measurements are entered in to the website each month and the biggest watermelon wins. Here at Chez KP, we doubt we can grow the biggest watermelon but we aim to have lots of fun trying. I feeel ready to talk about broccoli now. I’ve been having fly by the seat of the pants week in the kitchen, no plan just a fridge and pantry full of produce. As it’s getting towards the end of my shopping week, I had a rummage through the vegetable bins today to see what needed to be used. Roughly 1 1/2 heads of broccoli and maybe 1/8 head of cauliflower was allocated to tonight’s dinner. Not a huge amount of variety but that’s fine. The beauty of eating quite seasonally is that one gets used to making meals from limited variety. It certainly doesn’t mean it has to be boring. As is the case most night’s around here, I had intended for whatever I came up with to be cheap, vegetarian and quick and easy. Mission accomplished. Combine broccoli, cauliflower, cottage cheese, paremesan (if using), seasoning and tomatoes. In a greased baking dish, create a layer of half the lasagne sheets. 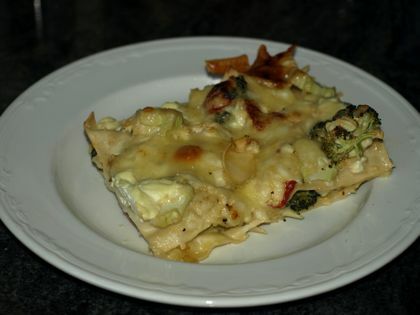 Cover with half the broccoli mixture and sprinkle half the tasty cheese over that. 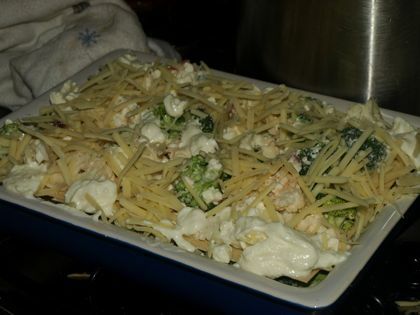 Make another pasta layer, cover with the remaining broccoli and sprinkle with the remaining cheese. Bake until golden. About 20 minutes. Serve with a salad if you can be bothered making one. I couldn’t, my head is still a little stuffy. pretty flower. 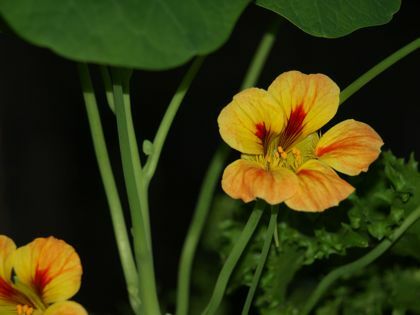 I love the ubiquitous nasturtium, and the smell of it which always reminds me of childhood wanderings around a lake near where I used to live. Lasagne looks good too – it’s really satisfying to be pulling odds and ends out of the fridge/pantry and coming up with a meal that is seasonal and fresh. Seasonal eating is something we’re pretty dedicated to over here. It’s always exciting when the next food season arrives. Right now we’re getting very enthusiastic about broadbeans, (adore ’em). Usually accompanied by feta. Oh – and now mangoes are out and about. Life is good. Docwitchs last blog post..The To-Do List. Du Jour. It is satisfying. Although my broad beans ar struggling this year. I suspect the seed quality is the issue. They’re pretty old seeds. The plants are short and although full of flowers, there are no beans. Which is particularly sad now you have me fantasising about broad beans and feta. Yum. What do you win? Hopefully some cash to offset the water bill after growing those melons.